As the Maker/Design Coordinator at the International School of the Peninsula I have the privilege of spending my days in the “makerspace” designing and facilitating lessons to encourage tinkering, exploration, collaboration, and creativity, all in service to the act of creation and skill building. I have a passion for learning by doing and as an educator have always kept that at the forefront of my teaching. Recently I reflected on a session I had with third graders in Design class on circuitry. I had placed some materials in a few boxes including batteries, small LED lights, aluminum foil, wooden sticks, pipe cleaners, and straws, and placed them in the center of each table with the idea that I would let the kids explore the materials and hopefully come to some conclusions about their relationship to each other, and how some could conduct electricity and some couldn’t. Most groups went straight for the LED light and coin cell battery and made it light up by squeezing the positive and negative leads of the light to the positive and negative terminals of the battery. Distracted by the fact that they made something light up, the other materials were left in the box untouched and unexplored. I thought to myself, “fail.” I had hoped that at least one student would make the connection between the battery, the light, and the conductive materials int their boxes in order to segue into extending electricity through circuits. No luck. Makerspaces are an exciting space to foster creative learning through building artifacts. These 21st century engineering workshops are a growing area of interest for both education researchers and school practitioners, and many resources (e.g. makered.org) refer to the benefits of making for children as young as Kindergarten aged. 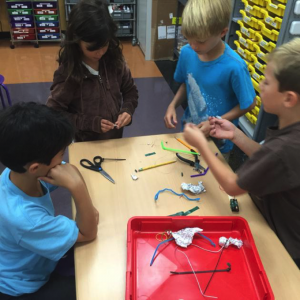 However, most makerspaces are designed for much older age group. With support from the CEEO Innovation Fund, Ph.D. student Amanda Strawhacker and M.A. 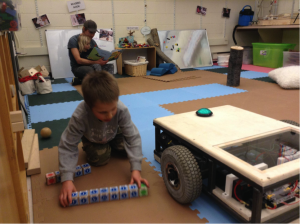 student Miki Vizner, both of Tufts’ Eliot-Pearson Department of Child Study and Human Development, set out to research and develop a developmentally appropriate Early Childhood Makerspace, for children ages 4-8 years. This mission of this space is, 1) to serve an active making community of children and their guardians or educators, and 2) to provide a testing site for Tufts researchers to investigate making and learning in early childhood.